What is the Credit Learning Center? The Credit Learning Center brings targeted, quality education to your desktop from the name and brand you've trusted for more than a century - NACM. Carefully selected, expert instructors present 50-minute audio/visual presentations on a wide array of topics. You choose what learning module you want to take, and when, and view it on your computer at your convenience. You may also work toward completion of a course or specialty certificate. The Learning Center will continue to expand as more modules are created and added. How do I use the CLC? Browse in the Credit Learning Center to see what modules, specialties and courses peak your interest. Decide which modules fit your needs or fill a knowledge gap. Select individual modules on any topic of interest or need. 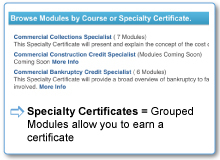 Select a group of modules, comprising a Specialty Certificate. Purchase as a package for a discounted price. Select a Course. The Business Credit Principles course is available on the Credit Learning Center and meets the course requirement for the Credit Business Associate (CBA) Designation. Make your Purchase when you are ready. Log in to the website (using your NACM username and password). 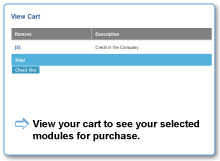 Click the Add to Cart button next to the module, specialty or course you wish to purchase. View at your convenience. Go to My Account and choose one of your modules. Click on View to start your presentation. Pause and print out the slide presentation for note taking or review. The purchaser and the learner should be the same person - modules are purchased by, and sold to, individuals. The purchaser's name must correspond to the user's name. Companies wishing to purchase modules on behalf of multiple users should coordinate its purchase through the NACM Education Department. You can purchase a module today, and view it at any time – as your schedule permits. Click the blue button below to browse the CLC and make purchases.Log in to the website (using your NACM username and password). Click the Add to Cart button next to the module, specialty or course you wish to purchase. Purchase price for individual modules - $89.99. What is a Learning Module? 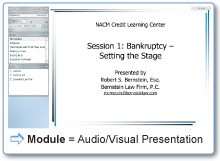 A Learning Module is a single 50-minute audio/visual presentation that you view on your computer, followed by a short quiz. The total time needed to complete one module is approximately 60 minutes. The presentation may be paused during viewing or printed to use as a reference. Most modules include a 10-question, true/false, multiple choice quiz at the end of the module session. The quiz serves as verification that you have completed the session and tests comprehension of the material presented. Taking the quiz is required to earn continuing education units (CEUs) for a module, but, passing the quiz with a score of 7/10 is required to use this module as part of a specialty certificate or course. If needed, you may take the quiz a second time. 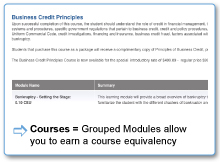 New modules are created regularly - check in to the Credit Learning Center often to see what's new. The cornerstone course of the Credit Business Associate (CBA) designation, Business Credit Principles, is offered through a selected group of 19 different modules. The course is priced at $675 and includes a copy of the textbook Principles of Business Credit. Thirteen highly qualified, carefully selected professionals serve as the instructors of the 19 modules. Successfully complete each module, by scoring 7/10 or better on each quiz, to complete the course and satisfy this course requirement of the NACM's Credit Business Associate (CBA) designation. Students have 182 days from the date of purchase to complete the course. After this period, courses are subject to removal or updates due to NACM’s continued commitment to providing exceptional educational resources for credit professionals. Continue your course requirements to earn your Credit Business Associate (CBA) designation by taking Financial Statement Analysis 1 through the Credit Learning Center. This course is a series of 50-minute modules presented by Dr. Frederick C. Scherr, Professor Emeritus of Finance at West Virginia University. Successfully complete each module, by scoring 7/10 or better on each quiz, to complete the course and satisfy this course requirement of the NACM's Credit Business Associate (CBA) designation. Students have 182 days from the date of purchase to complete the course. After this period, courses are subject to removal or updates due to NACM’s continued commitment to providing exceptional educational resources for credit professionals. Course price is $675.00 and includes a copy of the textbook Understanding Financial Statements, Custom Edition, by Fraser and Ormiston. Special shipping fees apply to any registration that requires textbooks to be shipped to an address outside of the continental U.S. Please contact the NACM Education Department for more information at education_info@nacm.org or 410-740-5560. Choose the course you wish to buy. Purchase by clicking on Buy the Whole Course. Complete your purchase. To View, go to My Account, click on View next to the module you wish to see. View each module at your own convenience. Take the Quiz after viewing a module. You may take the quiz right away, or wait and take it later. You will need to complete all the quizzes in the Course with 7/10 correct. A module can stand alone or when combined with other modules, may allow you to earn a specialty certificate or satisfy a specific course requirement. NACM has designed several groupings of modules to comprise "Specialty Certificates". Satisfactorily complete all of the modules comprising a "specialty" to earn a certificate in that specialty area. For example, to earn the Basic Commercial Collections Specialist Certificate, you will need to successfully complete all of the modules required. Watch for more specialty certificates . . . more specialty certificate choices will be added to the Credit Learning Center regularly. "I think this would be a very good course for anyone in the commercial collections field. It explains the difference between consumer and commercial accounts. I found helpful information even though I have been in the credit and collections field for 26 years." How do I earn a Specialty Certificate? Choose the Specialty Certificate you wish to buy. Purchaseby clicking on Buy the Whole Specialty Certificate. Complete your purchase. To View, go to My Account, click on View appearing next to the module you wish to see. View each module at your own convenience. Take the Quiz after viewing a module. You may take the quiz right away, or wait and take it later. You will need to complete all the quizzes in the Specialty with 7/10 correct. Step 5: Print Your Certificate after you have successfully completed all the modules. Click on Print Certificate. Your purchase allows you two viewings of the presentation. Modules can not be viewed on tablets; please use a desktop or laptop computer with Adobe Flash. If you have a question about the educational content or requirements, contact: education_info@nacm.org or 1-800-955-8815. If you have a technical question or technical/equipment failure during viewing, contact: nacm@commpartners.com or call 1-877-488-2666.